This article is about the magazine. For musicians who play guitar, see guitarist. For the Tal Farlow album, see Guitar Player (album). Guitar Player is an American popular magazine for guitarists, founded in 1967 in San Jose, California, United States. It contains articles, interviews, reviews and lessons of an eclectic collection of artists, genres and products. It has been in print since late 1967. The magazine is currently edited by Christopher Scapilitti. 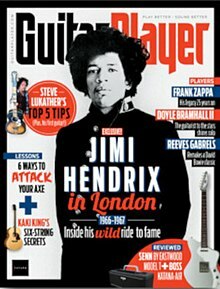 A typical issue of Guitar Player includes in-depth artist features, extensive lessons, gear and music reviews, letters to the magazine, and various front-of-book articles. In May 2006, the Music Player Network partnered with TrueFire TV to launch an internet-based television station for guitarists. It provides content similar to that of the magazine such as interviews and lessons. Guitar Player TV is provided at no cost to the user because of advertising and sponsorship. Guitar Player has a yearly competition now called "Guitar Superstar", which used to be the "Guitar Hero Competition". ^ "Guitar Player Brand Report". BPA Worldwide. December 2012. Retrieved July 4, 2013. ^ Sam Hodges (July 4, 1988). "The Picks of The Music Press". Orlando Sentinel. Retrieved February 19, 2016. This page was last edited on 23 December 2018, at 13:49 (UTC).